Like lines in a song, the outline of the horizon was revealed as the sun rose higher. Poetry, almost – two parallel lines, trees hovering like clouds. Shaking his head, the outlines became more distinct, his vision clearing. The night had been longer than most. This watch seemed to go on forever, the sounds of the forest around him echoing against the mist. He’d never been happier to see a sunrise. Wiping his eyes one more time, he lowered his gun, sighting the horizon, waiting for movement. Poetry would have to wait. The photo prompt is courtesy of Madison Woods, copyright Maggie Duncan. Madison’s story can be found here, along with links to all the other Flash Friday Fictioneers. What a wonderful line ‘two parallel lines, trees hovering like clouds’. It leaves me wondering what he was on guard for. Somehow, this picture made me think of Vietnam and the character is a soldier on patrol. Not sure why that image came to me, but there it is. I agree with Linda–beautiful opening! Nice one Erin. A real sense of waiting in this… for what I wonder. This was a very tight and well written piece. Peaceful and beautiful yet mysteriously perilous. i wondered if the quarry was human. I wondered where we were and when and I wondered what was going to happen next, which is the hallmark of good writing. Well done. Thank you for stopping by my story earlier in the day. I appreciate the feedback. I’m glad to hear it – and appreciate your kind comments. Thanks! I like the comparison to lines of a song and to poetry in your first paragraph. I, too, wonder what the quarry is. My first thought was animal but waiting awake all night seems a bit excessive for that, and the word “watch” steers me away from animals, so I wonder along with Doug if the quarry is human and what the rest of the story is. Good job. Yes, it is from the point of view of a soldier who’s been on duty all night and is glad to see the light. Not a happy time. I love the way you mingled beautiful imagery with tension. A skillfully written piece. Thank you, Rochelle. I’m glad you enjoyed it. Off to read yours next! Thanks! I enjoyed yours very much this week – a great snapshot of life in your part of the world. Beautiful imagery, and the line about poetry having to wait–perfect. Thanks for a great story from my photo. I really loved the photo – where was it taken? It made me think of far off places, like Africa, Vietnam – but maybe it’s the Smoky Mountains? Hard to say. Off to read yours now…. In the Shenandoah Valley of Virginia looking across a farm below where my house is. Very nice Erin. Liked that you could incoporate the hills in the picture …”parallel lines”. I thougth hunter at first, but soldier is more like it. Of course he’s happy to see sunrise. Great short story. The first paragraph reminds me of scanning down a page of music. A very well crafted story, Erin. Thanks, Russell, – the first lines came into my head without really thinking – I had intended it to be about a soldier, so I had to figure out how it all went together. A soldier perhaps on guard duty? The mind still able to remember a song and think of poetry even in a dangerous situation….Loved it! I think music and poetry were his lifelines to his old world. It was beautiful, even with the tension. With the title, I thought he was waiting for someone to pounce at him at any moment, as that’s the part of the film that still makes me jump. I imagined he had been drafted too, not sure why, but I thought he sounded more nervous than a career soldier, although who wouldn’t be nervous on watch on a dark, misty night? Yes, that same sort of nervous tension of waiting for something that may or may not happen. Thanks! That is gorgeous — and you were able to catch how I felt when I first saw the picture, with the lines of poetry. So lovely! It is a really lovely picture. I probably just could have gone with the beauty of it, but I liked the contrast of beauty and fear. Really nice, Erin, reminds us how much war can take away and that soldiers are people too. Made me think of the poetry from the trenches, somehow. Thanks for stopping by mine too. Yes – many times, just scared boys trying to be men. I watched a lot of news covereage when I was a kid about Vietnam and it stayed with me. Some of them were so young. Thanks for your comments! I love the way you used words here, very nice. I see by all the other comments now that it is a soldier on watch. I had thought something more sinister. Well written! Glad you could feel the tension! very nicely done. I could see it, and sometimes after seeing beauty a man must steel himself for ugly reality. I thought of Vietnam while reading your story, but it could have been anywhere, including a fantasy realm. Nice inside glimpse of what sounds like a tension filled time of the character’s life. Thanks, Madison – as always, I enjoyed yours. Thanks, Lora. I like that idea, too. Will go read yours shortly! I, too, got a sense of a soldier on his post and the magic moment when the night is gone and day has come again. I agree this could work in many different genres. Very expressive and creates a vision of the photo without the photo being needed. I like that with only 100 words, we have to leave some things up to the reader to determine. It interesting to see what they fill in with. Thanks for your comments! 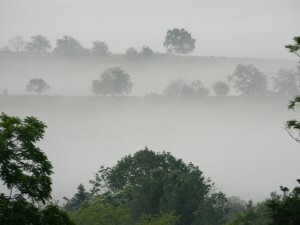 Yes, those crests of trees emerging above the mist do seem like lines of music. That hadn’t occured to me, and that specific idea comes to me often, with birds on powerlines for instance. I really like this. Thank you. I have that same thought about birds. I almost called the trees “like notes on a stanza”, but I thought that was getting a little too specific. I appreciate your comments! Ooh, great contrast of poetry and battle here. I love your descriptions – the trees hovering, the poetry lines etc – they are so vivid. One tiny concrit – I think “to see a sunrise” not “a sun rise” – unless this guy has come across multiple suns in his life, which is possible I guess, since we don’t know where your story is set. Thanks for the input! I’ll make that change. A beautiful depiction of a soldier, but I wonder about the what where and why! It is very intriguing! I imagine every sunrise he saw while on patrol was a good one.